Toon the 18th best supported team in Europe, 3rd in England. | NUFC Blog. Toon the 18th best supported team in Europe, 3rd in England. 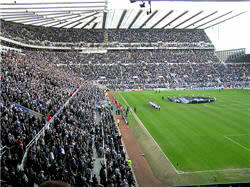 With an average attendance of 48,750 last season, Newcastle United are the 18th best supported team in Europe. In England only Manchester United, who top the whole league, and Arsenal manage to beat Newcastle’s average attendance, although Celtic managed 9th and Rangers managed 16th. Given the mess we were in last season and the fact that there were boycotts of some games, that’s not a bad showing at all, although we are down from the 12th position we achieved in 2007-2008. Realistically, give the capacity of St James’ Park, the absolute best we could have achieved would have been 13th or 14th. Summed up in a sentence bigbadbob. quite surprised at the crowds the german clubs get. Dortmund 74k, amazed. I had no idea. I thought we would have been higher actually. Troy a lot of their grounds were refurbed / extended for Euro 2008 and I believe watching games there is much much cheaper than we have to pay. Troy – I got exactly the same surprise. I mean, I knew they were big on their footy but thought the grounds were smaller. Mags09 has explained that though. Not sure where part of my message went before, but I’ll ‘edit’ it so it makes sense. We are clearly micey. Case in point, I stopped watching regularly to concentrate on playing when we were just starting to get good and then sixteen years later, my circumstances change and I start watching again when we get relegated and we’re sh*te. My mate has sat in the same seat for seventeen years (where we sat in the Leazes) and in his old East Stand seat for 8 years befor that and despite being a cynical get, he wouldn’t change it for the world, even now. Can’t call us fickle in terms of loyalty only to glory, eh? Off away for the day – but I feel safe and warm in the knowledge that my new protégé Stuart79 will defend the club and Mike Ashley at all costs today – and he will do his utmost to stop the Mob campaigning pointlessly tomorrow..
That`s a more baselessl statement than anything i have heard from Stardust. Can you just speak for yourself from now on. It should be no surprise that the German clubs are right up there in league attendance. For one thing their prices are considerably lower than the PL, plus I believe they have certain areas where standing is still allowed, resulting in a more efficient method of using the available space. Not by any means an advocating a return to Standing on a terrace, did too much of that, prefer to sit. Seems the EPL still generates the most income, due to a combination of Tv. money and the fact they have an enormous worldwide following, also an entertaining style of football, a combination of speed, technique and a certain physical nature. The result an easily marketable worldwide tv package, plus an enormous market for replica shirts etc. Chuck, you missed the main reason. Clubs on the mainland of Europe tend to have a bigger catchment area and that includes Germany. Berlin for instance, one of the major cities of the world has only one major team, Hertha. Munich is another very large city and they only have Bayern and 1860 (currently in the German second division). Dortmund is only slightly smaller than Manchester and Salford put together, yet they only have one major team to Manchester and Salford’s two, or Birmingham’s three. Yeah, suppose that`s right, also the fact they attract larger audiences could be a combination of larger grounds and lower priced tickets. At present it appears both Spurs and Liverpool intend to build new grounds ,Man U. have expanded, Arsenal have a new sixty thousand seater, so it appears an average of fifty thousand plus is required. Pity the Burnleys and other small town teams that even with such sized stadiums would be all but impossible to fill. On catchment areas, one can wonder at the Clyde Valley area, which supports the majority of teams from all the three leagues in Scotland, and probably has a smaller population than say the Ruhr valley in Germany,is that an exception too, or does it prove the rule ? There are exceptions Chuck, like Hoffenheim, which is a phenomenom under dream owner, Dietmar Hopp (Germany’s biggest software gadgie) and possibly Shalke04. Shalke is Gelsenkirchen which isnt a big city, but it emcopasses alot of smaller towns in the Ruhr Valley and they’re like Geordies, mining types who are absolutely gaga about football. Generally though, it is true. The big two in Scotland get huge crowds, partly due to religious warfare, but there’s no money in the Scottish league. Even a few games in the early stages of the Champions League can’t make up the shortfall for them. Workyticket @15 ..good call regarding Schalke 04 being from mining stock….in fact Gelsenkirchen and Newcastle are actually twinned cities….I have actually been to the new Schalke arena, absolutely mental !! the Schalke fans also have a traditional hatred of Dortmund as the toon v makkems….but only worse ! !